This is the try-hard hipster of all films. It’s desperately trying to be different, but the result is a confused interpretation of those who invented the style. It took me about 24-hours after watching The Double to decide whether I admired or hated it. Unfortunately for Richard Ayoade it’s the latter. I appreciated everything he was trying to achieve but he just didn’t pull-off the desired effect. It felt like I could see everything he was trying to do, the tricks he used to do it and who he learnt those tricks from. It felt like I was watching a puppet show with the curtain removed – it was hard to focus on the show without watching people pulling strings in the background. It’s a shame too because I really loved Ayoade’s directorial debut Submarine. It was the sleeper hit of 2010 and I’d rank it in the same league as beloved oddball gems like Rushmore and Harold & Maude. Ayoade combined quirky arthouse humour with genuine characters and feelings. 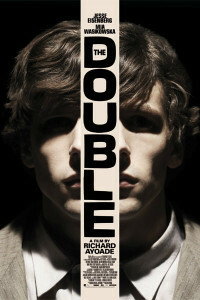 The Double tries so hard to be a dark arthouse classic that it fails to make any connection with the audience. This film is so focussed on how it wants to be seen that it’s lost all awareness of how it’s actually viewed. A trait also shared by the film’s lead, Jesse Eisenberg. The problem I have with Eisenberg is that he’s spent an entire career trying to find these kinds of roles, completely ignoring the fact we, as an audience, can see what he’s trying to do. It’s like knowing a prize fighter is picking his fights to win, and everyone knows he’s doing it. It’s hard to cheer him on because it’s so forced. In the film Eisenberg plays Simon James, a socially-awkward loner who is invisible to the world. He is obsessed with a girl from work (Mia Wasikowksa) but can’t utter a word let alone tell her how he feels. In steps James, who is also played by Eisenberg. James is different to Simon in every way and soon takes advantage of everything that seemed out of Simon’s reach. The other major problem with Eisenberg playing these two extreme personalities is that he isn’t cool enough to portray such an extroverted character. Where Fight Club had Brad Pitt playing the opposite of Ed Norton’s white collar weakling, Eisenberg is attempting both parts. At times it feels like re-watching Tobey Maguire’s dance scene in Spider-Man 3 – cringe-worthy. Luckily he’s held up by an impressive support cast. Throughout Ayoade’s impressive career he’s made some talented friends and they all feature in some form or another. There’s Noah Taylor, Chris O’Dowd, Wallace Shawn, both Craig Roberts & Yasmine Paige (both from Submarine) and Paddy Constantine, in one of his more bizarre cameos. The redeeming feature of The Double is the thick black humoured apparent throughout, which has become a signature of Ayoade’s style. It’s just unfortunate some of the better moments are lost in his attempt to mimic the styles of his mentors. The film is like a huge nod to the likes of Kubrick, Lynch, Fincher and even Wes Anderson. The influences are undeniable. Some of the almost nightmarish sequences are straight from David Lynch’s handbook and the constant industrial background noise echoes that of Fight Club… but don’t take that as a clue to the story.